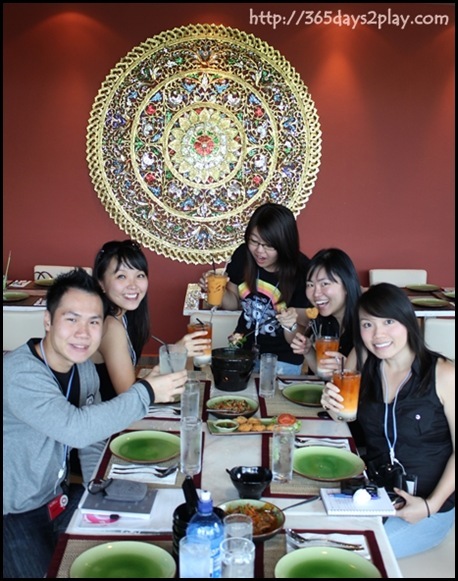 Another lovely restaurant we visited during our Amazing Blogger Race through Greenwich V was the Mai Thai Restaurant. Unlike Paradise Inn which I have been before and familiar with, this was the 1st time that I had heard of Mai Thai Restaurant. 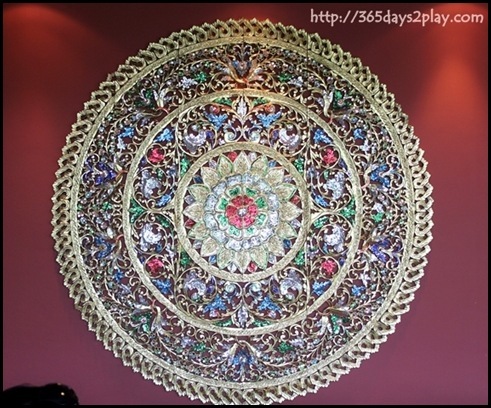 It was soothing to enter the bright and cheery restaurant, and greeted with customary Thai hospitality. Apparently, the restaurant’s motto is “Prioritizing Service over Food”. Sounds odd at first, but it goes to show the amount of confidence they have in the quality of their food that they wish to also highlight service as a priority. Similar to Paradise Inn, Mai Thai at Greenwich V also boasts floor to ceiling glass walls, or should I call it windows, which lets in sunlight, allowing the food to appear even more attractive and palatable under the natural lighting. 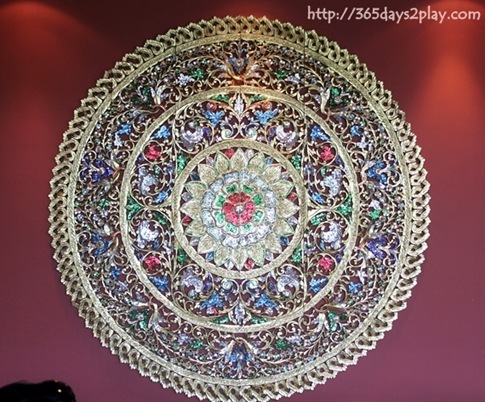 Check out this huge decorative piece or what you may call it. Stunningly pretty to look at, photo doesn’t do justice. 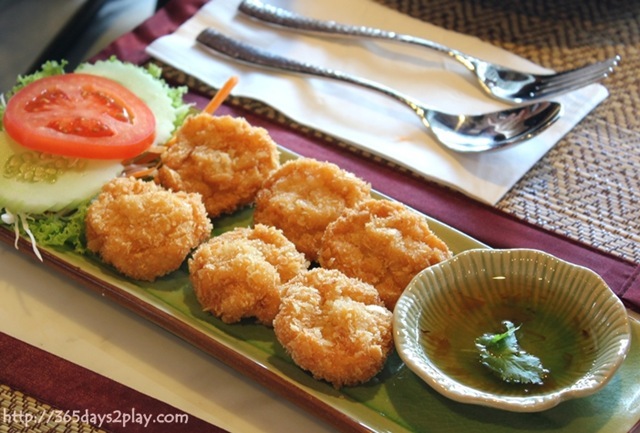 Prawn Cake / Tod Mun Goong (5 pieces for $12) – Deep fried prawn patty with plum sauce. Enjoyed the prawn cake very much. It was piping hot and crisp on the outside. There was a lot of prawn in the prawn cake, which is good cuz some places like to fool you by giving more fillers instead. The sweet sour plum sauce was a great accompaniment to the prawn cake and on the whole, whetted my appetite even though I’d already eaten a lot at the previous restaurant! 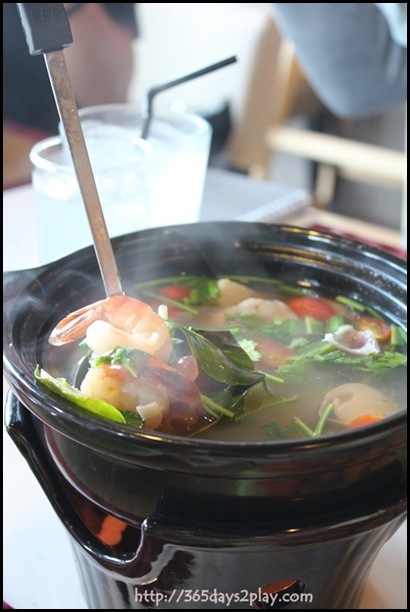 Tom Yam Soup/ Tom Yam Goong $16.50 – Classic Thai spicy & sour soup with prawns and mushrooms. I can’t take overly spicy food and this spicy Tom Yam soup literally changed my definition of how spicy a soup can be! Beware, don’t take large gulps at one go no matter how appetising it may look! 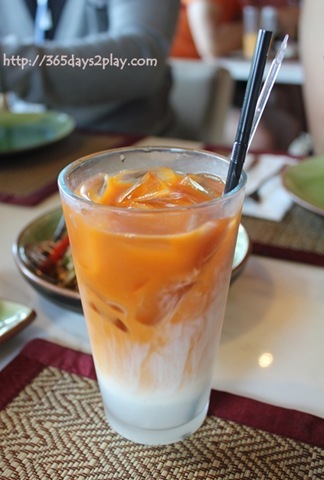 After using the Thai Iced Tea to cool down my tongue, I managed to cut through the spiciness and appreciated the freshness of the ingredients. 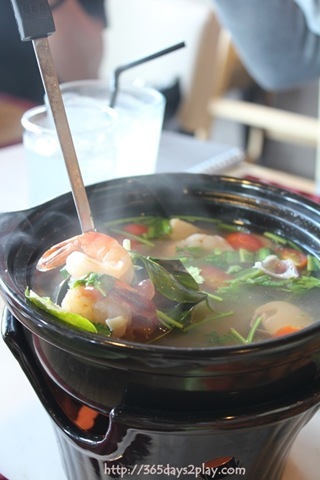 The soup is very clean tasting and the ingredients such as prawns and mushrooms still retain a good bite. Also loved the tomatoes which added a nice tangy zing to the soup. 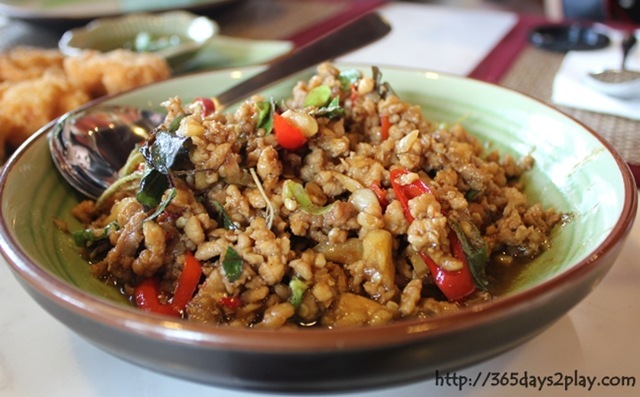 Basil Chicken / Ka Pao Gai $15.50 – Stir-Fried minced chicken with Thai chili paste, basil leaves & onions. Another spicy dish so beware. The chicken was fragrant and tender. A good dish to order with rice. Mai Thai Beef Panaeng / Panaeng Nuea $18 – Beef shin in rich red “Panaeng” curry of coconut milk and enhanced with herbs. I was surprised by how tender the beef was. I ate one whole piece by myself even though I was practically bursting. The curry was rich and flavourful. 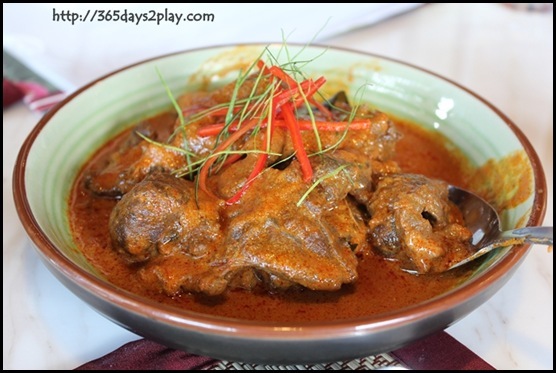 Interestingly, this curry dish wasn’t as spicy as the Tom Yam Soup or the Basil Chicken. 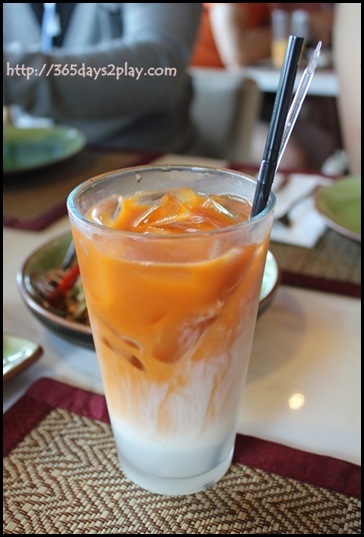 Thai Iced Tea $3.50 – And a very refreshing large glass of Thai Iced Tea to wash down all the spiciness. They also have a Thai Iced Coffee, which I’d originally wanted to order to give me extra energy, but it was sold out. All too soon, we had to bid adieu to Mai Thai (yes we spent a grand total of 20 minutes there!) in our quest to finish the Greenwich V Amazing Blogger’s Race. 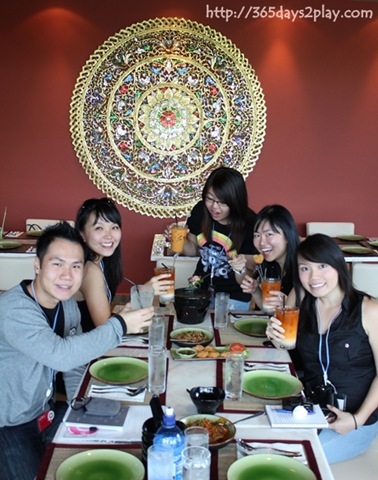 Hope to be able to visit Mai Thai again soon. Easties and Westies can rejoice for Mai Thai is also located at Telok Kurau as well as Chip Bee Gardens. Read about my visit to Paradise Inn at Greenwich V, as part of the Amazing Bloggers Race.